During the recent ash cloud crisis in Europe, many organisations were crippled by an inability to reach clients or colleagues around the world. Using MindGenius in conjunction with web collaboration tools such as Webex or Netviewer, allows organisations to collaborate with customers or clients, regardless of geography. One organisation who is doing this across their enterprise is Baker Hughes. Throughout the global spread of its operations, a growing number of Baker Hughes employees are using MindGenius to communicate, collaborate and complete projects across geographical boundaries and to improve the efficiency of meetings, project work and team interaction. The use of cutting-edge technologies enable employees to conduct effective, virtual meetings that allow for the same level of interaction and knowledge exchange as face-to-face meetings. Whether virtual or face-to-face, teams use applications such as MindGenius 3 to capture, structure and transfer knowledge in real time. Meetings are fast paced. People have full schedules and want to see results within short periods of time. With a variety of ideas coming from different directions, they need a medium which can capture thoughts rapidly. MindGenius is quick and easy to use and enables them to capture and refine thoughts as swiftly as they are expressed. At the conclusion of meetings and work sessions, information maps can be exported to a variety of file formats such as MS Project, Word or Excel or converted to jpeg or png files. The format into which maps are converted depends on project requirements, the way the information will be used and on team member preferences and skill sets. The addition of an integrated GANTT view to MindGenius Version 3.5 has allowed certain stakeholders who may not have or require MS Project to complete key project management functions in a GANTT view that has been generated straight from the visual map in the meetings. Through the use of tools such as MindGenius 3, meetings and collaboration are more effective in face-to-face as well as virtual contexts. This improves productivity and enables team members to meet project requirements and tight deadlines across geographical and time boundaries while reducing the need for travel and cutting cost. Here at MindGenius we use this method ourselves and hold online meetings using MindGenius and a web collaboration tool with customers, no matter where they are in the world. Have you tried this technique of keeping in touch with clients and customers? What are the key advantages for you? In this issue, we would like to focus on how some of our customers are using MindGenius for more than mind mapping. Hopefully this will give users old and new inspiration on different ways they could be applying MindGenius, or different features that they might not have discovered yet. While MindGenius is based around the concept of mind mapping, it allows users to apply the concept to a multitude of different tasks and job roles: the common theme being the need to effectively manage large amounts of data. This quarter has seen MindGenius add many more individual users, as well as Enterprise deployments, to its user base. With more than 600,000 users, MindGenius is fast-becoming the mind mapping tool of choice for both business and education. 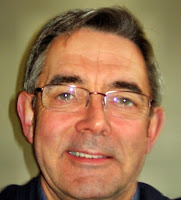 John Bothams was involved in Higher Management Education as Senior Lecturer at Strathclyde University Management School, delivering the MBA across the world and teaching on several Masters programmes and Executive Development courses. He was in the first cohort to obtain the MA in Management Learning from Lancaster University in 1984. He has been Senior Examiner for Young Enterprise Scotland for the last ten years and an examiner since 1992. He now runs his own consultancy company IRLS Ltd and still provides a Strathclyde MBA elective class. Find out more about IRLS at http://www.irls.co.uk/. I have been a convinced user of electronic mind-mapping for well over ten years. It has proved especially useful in my teaching of Higher Education courses in Management. This is because it provides the ability to see both the detail and the overview of problems and strategies, separately and together. All three views are necessary for activities such as problem solving or strategy building, as the details are then visibly linked to their context. The key advantage I have found in terms of learning is that electronic mind-maps help in the following unique way: by saving different versions of the mind-map when exploring a problem, working on a dissertation or class project, a record of understanding and learning is kept which is visible. From this record it is possible for students to reflect on how that understanding has been achieved. Reflection on the series of maps in this way leads to a deeper and longer lasting understanding of the subtle connections between different influences and thus easier transferability of learning to new situations. I have responsibility for setting an examination for over half of the 3000+ young people who take on the challenge of the Young Enterprise Scotland programme each year. The YES programme aims to inspire young people and prepare them to succeed in a global economy. It helps them develop their full potential and increase their confidence and self esteem, as well as test out their own business ideas by running a real business for nine months. The participants have a wide range of abilities in expression and the examination paper has to take this into account, which is no small task. Before setting this year’s examination I took the opportunity to use the latest version of MindGenius to explore a complete record of all the 10 years of past papers that I have designed, by pasting them into a single map. This is wonderfully simple to do, and achieved just by highlighting and copying and pasting each question and its prompts (a maximum of five per question). Using the ability to drag and drop, I could then cluster the questions round topic areas for comparison. In MindGenius 3 there is a function to code branches and then apply filters and this is what I used to study what I had asked in the past, and spot where gaps or new technology would give an opportunity for a new slant for a question. I used the new ability to code, but I needed first to develop my own categories to make the coding sensible to me. This was not only possible but easy, once I applied an update to the program made available around the time I tackled this activity. I was able to use a symbol picture to do this categorisation (see screen capture of a 2010 question), for example by using a green ball to denote sustainability questions or prompts. By applying the filter for this symbol, only questions or prompts about sustainability were visible. This enabled me to isolate the detail. 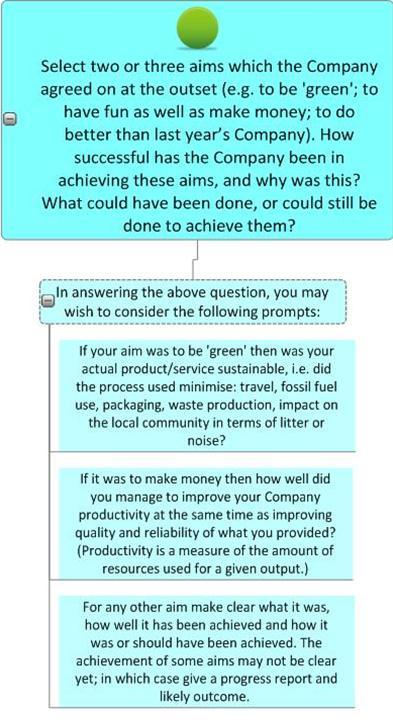 By removing the filter I was then able to see those sustainability questions in relation to all the other questions set and get a feel for the links and contextual setting. Please click for full screen view. I would not have been able to do this had I just read the last ten years’ papers. It meant that I was confident that this year’s examination paper was on a really solid foundation and the prompts for the examinees were clearer than previously. I then produced mind-maps of answers based around my own experience of a Company to get a feel for being an examinee and was able to make further adjustments to wording. The result this year was that we saw a decrease in the failure rate to just 2%, the lowest rate that I believe to be possible and 7% less than ten years ago. I believe this reduction in failures was greatly aided by my use of MindGenius in the preparation of the paper. It ensured that candidates had a balanced paper and focused prompts from which to relate their own experiences of running their own Young Enterprise business. 98% of those who took the examination were able to produce answers ranging from satisfactory to excellent. West Kent College in Tonbridge, Kent installed a MindGenius site licence in September 2004 which gave access to their 2,300 full-time and 12,000 part-time students on all of their 1,500+ PCs and laptops. Former dyslexia tutor Chris Sellers, herself a dyslexic, persuaded the college to purchase a site licence after researching suitable electronic mind mapping software solutions. MindGenius is used across campus by students, tutors and lecturers. In this edition of the newsletter, we will look at how the Dyslexia Department are applying MindGenius to support students with dyslexia with course work, literacy and developing strategies to cope with specific dyslexic difficulties. Nicky believes that MindGenius is dyslexia friendly – everyone can disseminate information and the act of building a map is a very positive experience. Students use it to classify information, sort out what to include in essays and presentations, explain thought patterns, organisation, sequencing, forming a logical argument, and grouping facts. Although it can be difficult at first for some, if they can talk about building their map this can help to internalise the main structure of what they're trying to do and they can take ownership of their ideas. MindGenius is ideal for those with dyslexia as it means they can go back to the map, change their mind and easily move misplaced branches and check their spelling. Nicky had tried hand-drawn mind mapping techniques previously but students would become frustrated when mistakes were made, or more information had to be added and the map had to be re-created from scratch. 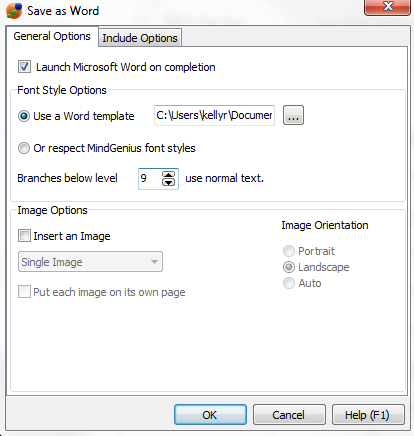 Another feature that is commonly used by students in the Dyslexia department, and across campus, is the export to PowerPoint. The trigger words created in the map for the presentation help to reinforce learning of the relevant facts. She shows her students how it works - then "presses the button" for the export to PowerPoint and watches their reaction! This simplifies the process of creating presentations and helps the students to focus on the content of the presentation before they move on to making it visually attractive. Nicky herself now uses MindGenius for everything from brainstorming to planning and revision. She has also used it to develop ideas for a conference, planning potentially difficult situations, developing coherent arguments, planning student essays and lesson plans. Nicky believes MindGenius is an excellent tool for developing lesson plans as she tends to include too much into them. Working with MindGenius allows her to get a picture in her mind of all her thoughts then 'dump' them into a map, where they can be refined, sorted and organised. Once the map has been developed, Nicky is able to achieve a clearer picture of how tasks will fit into the allotted time. The full story on how MindGenius is used across campus will be on the MindGenius website soon. Do you use MindGenius in your school, college or University? What do you find the biggest advantages are? One question we are often asked is; “How do I export my map to a basic word document”. What users are looking for here is the resulting Word document to adopt the same font style for all exported branch titles and the hierarchy of the map to be indicated by indents. MindGenius uses a Word template to define how the map looks once exported. Level 1 branches take on the Heading 1 style, Level 2 branches take on the Heading 2 style, and so on. Therefore to create a basic Word document on Export, you should create your own Word template that defines Heading 1, Heading 2 with an indent, Heading 3 with a further indent, and so on. 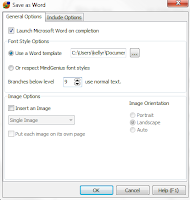 Then use the MS Word “Save as” feature to save as a Word template and select this template on the ‘Save as Word’ dialog when you export your map. Creating and using your own templates like this means that you can also pre-format the headers and footer of your exported documents with Company logo, page numbers, etc.